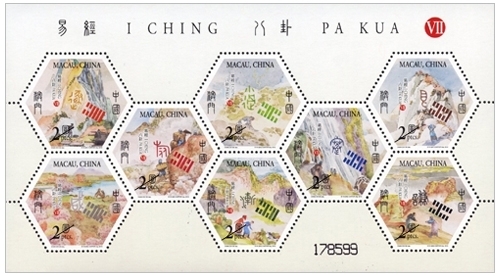 Macao Post issued six series of stamps “I Ching, Pa Kua” between 2001 and 2008. The seventh series will be issued on 1st March, 2010. 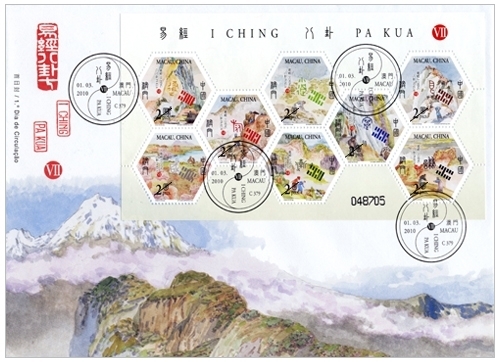 The symbols of Kua in this current series of eight stamps are: Dun, Xian, Lü, Xiao Guo, Jian, Jiang, Gen and Qian. 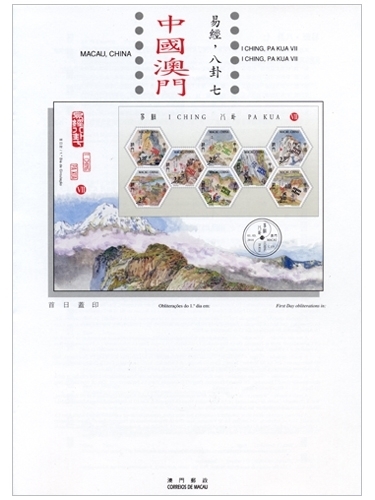 The design of the souvenir sheet is based on the symbol “Gen” which means “Mountain, Youth, Peak, Gathering”, the picture is entitled as “Reach a Peak”. 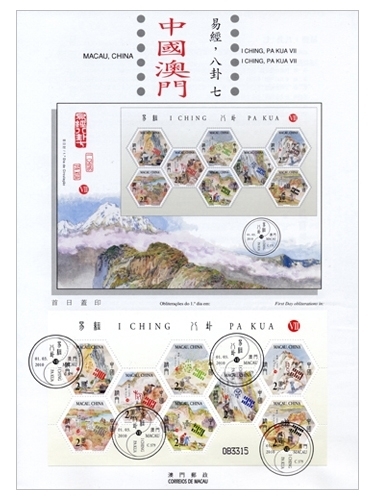 The stamp designer and the author for the information brochure of this issue are both done by Mr. Chan Chi Vai, President of Association of I Ching Investigation. 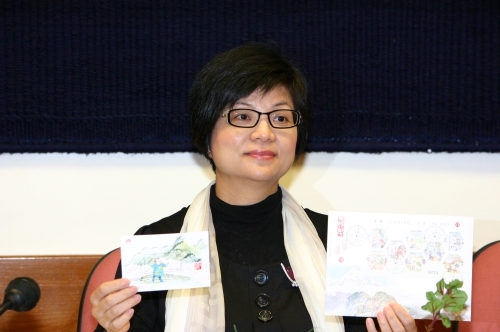 This is the second issue in 2010. 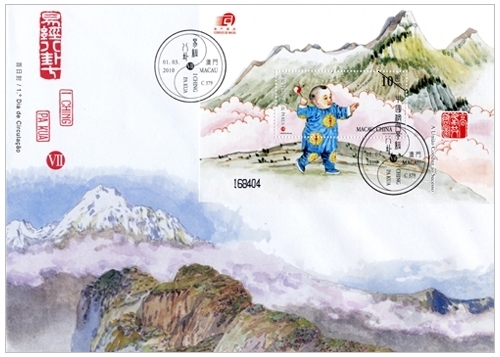 The previous issued stamp is “Lunar Year of the Tiger” on 02/01/2010. 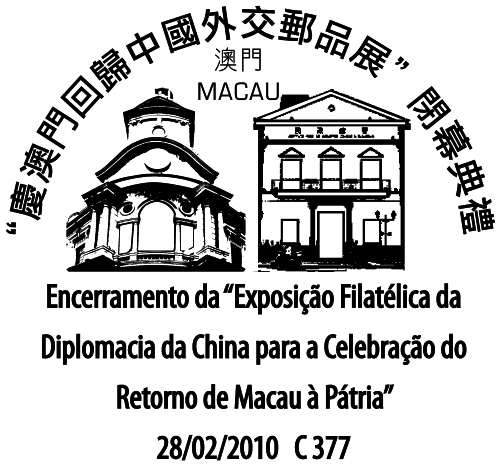 To cope with the Closing Ceremony of the Philatelic Exhibition of China’s Diplomacy on the Celebration of Macao’s Return to the Motherland, Macao Post announces that a Temporary Post Counter will be set up at The Grand Hall of IACM at 13:00 to 18:00 on 28th February 2010 providing the commemorative postmark cancellation service for the “Closing Ceremony of the Philatelic Exhibition of China’s Diplomacy on the Celebration of Macao’s Return to the Motherland”. 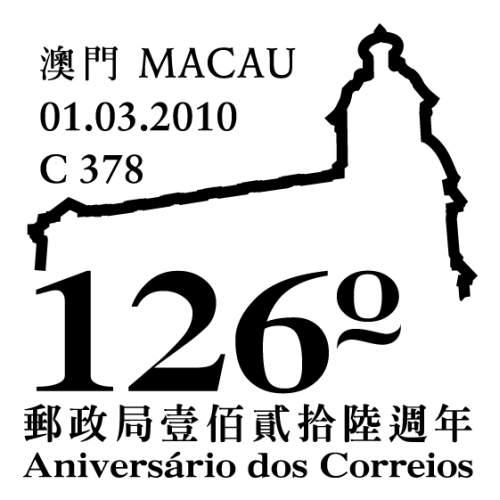 To celebrate the 126th Anniversary of Macao Post, Macao Post announces that a Temporary Post Counter will be set up at our Philately Shop located at Macao Post Headquarters and the Communications Museum on 1st March 2010 to provide the commemorative postmark cancellation service for the “126th Anniversary of Macao Post”. Philately Shop of Communications Museum: 9:30a.m. to 17:30p.m. 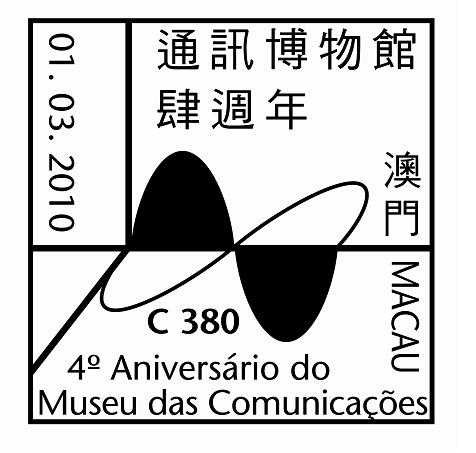 To celebrate the 4th Anniversary of Communications Museum, Macao Post announces that a Temporary Post Counter will be set up at our Philately Shops located at Macao Post Headquarters and Communications Museum on 1st March 2010 to provide the commemorative postmark cancellation service for the “4th Anniversary of Communications Museum”. 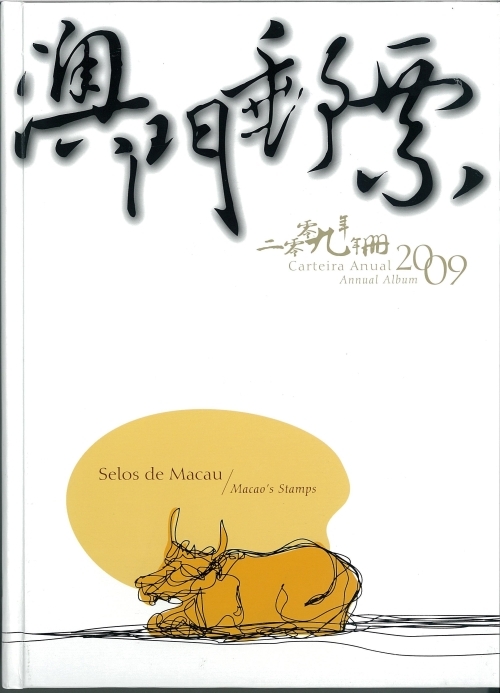 Macao Post will issue the Annual Album 2009 on 9th February 2010, it will be available for sale at the Philatelic Shop of Macao Post Headquarters, “Rua do Campo” Post Office, Maritime Ferry Terminal Post Office, Airport Post Office, and the Communications Museum. An elegant and protective hard cover is designed. 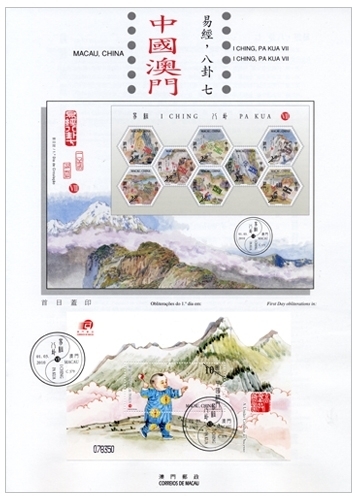 This album comprises the full collection of 2009 stamps and souvenir sheets, and also includes one self-adhesive stamp booklet, on which the colour stamp images and the technical data are printed on the pages. This Album is priced at MOP298.00, it is certainly an excellent product, either as a collectable or as an elegant gift. 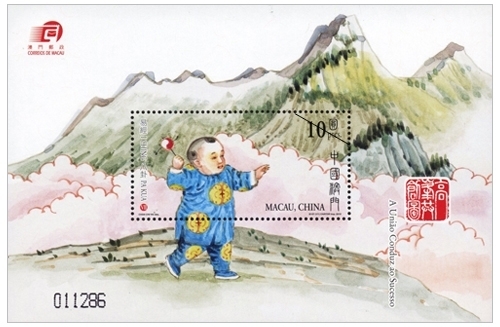 Customers can also purchase the empty Annual Album, by which the purchased 2009 Macao’s stamps and souvenir sheets can be protectively organized. 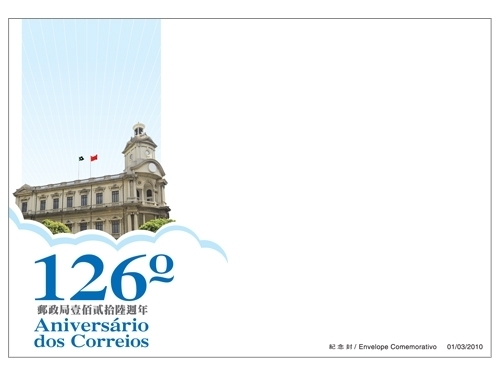 Empty Annual Album is priced at MOP80.00.